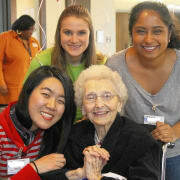 As a Wren Hospice volunteer you are part of a team of devoted nurses, social workers, CNA's and chaplains dedicated to providing patients and their families with personalized compassionate care. Hospice volunteers are the heart of hospice and our volunteers bring patients and their families so much love, peace and joy. We are in need of volunteers of all ages (15 and up) to work with hospice patients in the community and assist with administrative projects in the office. We value your various skills, talents and experiences and will work with you to personalize your volunteer experience and provide you ongoing support. Patient centered volunteer activities include, listening to someone's life story, providing companionship, respite sitting for caregivers, running errands, and helping with household activities. Support activities include office administrative task, creating patient cheer cards, making check-in calls and many more. To prepare you for your volunteer experience, we provide you with a comprehensive training and continuous support during your volunteer experience. Training times are flexible and designed to fit in your busy schedule. We would love for you to join our team and help us enhance the lives of our patients and their families!